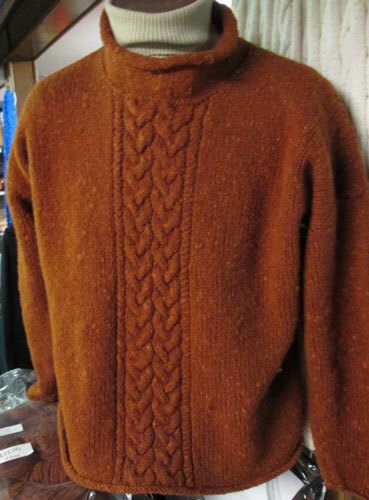 Pullover with cable front panel. This is a very casual pullover with a rolling neck, cuffs and bottom band. Drop sleeves. Finished chest 39",42", 46", 50" Length 28" to 30"
I knit it on the 5 mm needles and because I knit a bit loose I found it a bit floppy so I decided to shrink it a bit, not felt it but just enough to make it a bit tighter. I really like how it came out. I just put it in the washing machine alone on a gentle cycle. If you want to try this knit a sample about 5" by 5" and wash it in your machine. Machine are different and the results vary. A soft wool yarn with flecks of a lighter shade throughout, it also has a thick and thin texture. It knits as an Aran or Worsted Weight yarn on 4.5mm or 5mm (US8 or 10).